General Description: The Stark dart point is a small to medium sized narrow, contracting stemmed point with tapering shoulders and a rounded to pointed stem which can be stubby. The shoulders are the widest part of the triangular shaped blade. The shoulders are well defined and angled away from the stem. The stem is small and is tapered on almost all specimens. The base is pointed on the majority of specimens however it can be straight or concave or oblique as variants. The basal irregularity should be checked as broken or damaged bases can be the cause. The blade edges are convex and the majority of speicimens but straight and irregular edges are common. The stem edges are ground. The size range for the Stark point ranges from 37 mm to 70 mm in length. 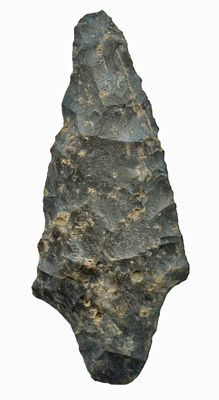 The point was manufactured from metamophosed siltstone, felsites, rhyolite, chert, quartz and quartzite. The Stark is part of the Morrow Mountain complex according to Justice. 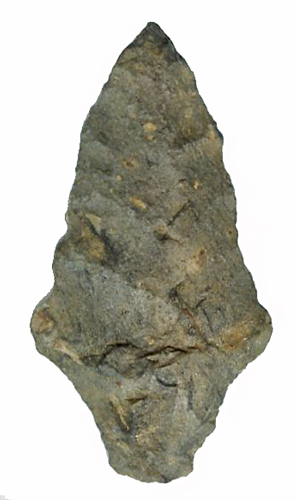 The Stark was named by Dena F. Dincauze in 1976 for Archibald and John Stark, the early settlers who owned the property of the Neville site in Amoskeg, Manchester, New Hampshire.